ANDOVER, Mass. 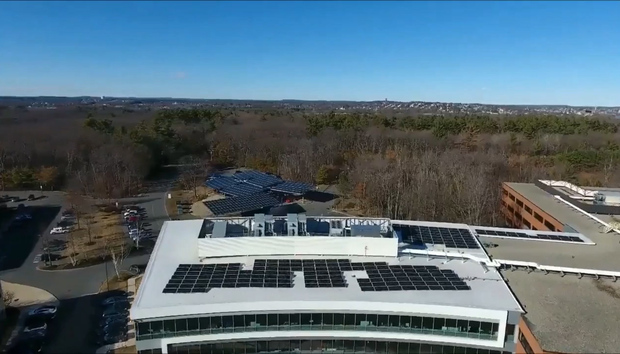 -- At the end of a heavily wooded, sparse industrial park here sits the North American headquarters and R&D center for Schneider Electric, which earlier this month unveiled its own campus power microgrid. The microgrid for the global energy management conglomerate is expected to produce 520,000 kilowatt-hours (kWh) of electricity per year, or 10% of Schneider Electric's power needs. It's also expected to reduce its energy costs by 20%. Perhaps more importantly, the microgrid incorporates a natural gas generator as an anchor resource, allowing solar panels to operate during grid outages to maintain critical operations. In the event of a power outage, a lithium-ion battery storage system would provide up to 100KW of power for an hour. The battery storage system can also help shave the power Schneider Electric draws from the local utility during peak operating hours, enabling it to avoid costly fees for exceeding its pre-set demand limits. While the microgrid does serve some of Schneider Electric's own power needs, it's also part of the company's R&D efforts to create more sophisticated smart microgrid technology to sell as a service to customers who must rely on an aging, less-reliable national grid infrastructure and rising electricity costs. 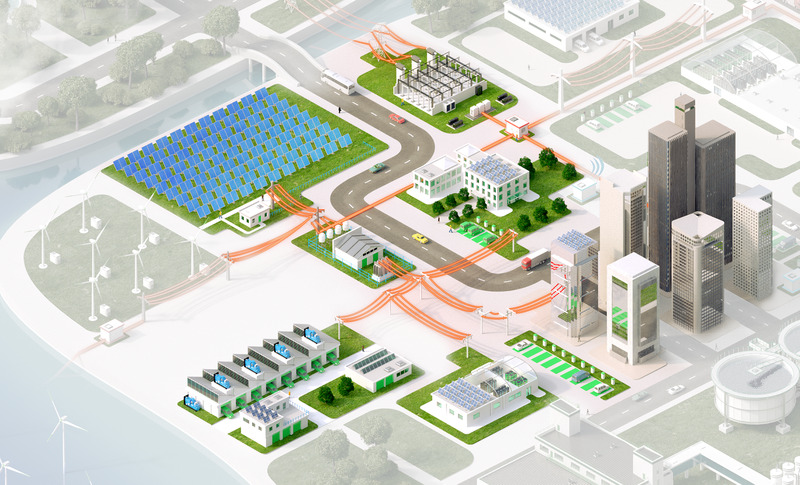 A microgrid is a form of distributed energy generation that can function independently from the traditional, centralized regional power grid; it can enable towns, small cities or corporations to develop their own energy sources and power storage systems (via lithium-ion or flow batteries), distribute that energy and even sell excess power back to local utilities. Duke Energy and Schneider Electric have collaborated on several microgrids. Above is a representation of what a microgrid would contain, including solar panels, battery storage, a power control unit, converters, and distribution lines . Microgrids also offer a quick response during high energy demand times or power outages. Currently, Microgrids only supply about 1.6 gigawatts (GW) of U.S. electricity, or less than 0.2% of installed capacity. Over the next three years, however, that capacity is expected to more than double, according to the Center for Climate and Energy Solutions or CCES, a nonprofit, non-partisan organization. Fueling interest in microgrids, CCES said, is their ability to improve resilience and reliability, increase efficiency, better manage electricity supply and demand, and reduce greenhouse gas emissions through the use of renewable energy. Installed solar power system prices by category. "The U.S. has been the best market for microgrids because our [national] grid reliability is much lower than other parts of the industrialized world, such as Europe or Japan," said Peter Asmus, associate director of Energy research at Navigant Research. Between 2003 and 2012, weather-related outages and the aging infrastructure have cost the U.S. economy between $18 billion and $33 billion a year. In 2015, Americans dealt with a reported 3,571 power outages lasting an average of 49 minutes, according to a report by the American Society of Civil Engineers (ASCE). The ASCE just gave the U.S. energy infrastructure a grade of D+. Without greater attention to aging equipment, capacity bottlenecks and higher demand, as well as increasing storm and climate impacts, Americans will likely experience longer and more frequent power interruptions, The ACSE said. "Local solutions, such as distributed generation and resilient microgrids, may offer lower-cost alternatives to major system investments particularly in areas at elevated risk from severe weather or other natural disasters," the group said. After superstorms Irene and Sandy in 2011 and 2012 left more than eight million homes or businesses without power, most states responded by introducing microgrid backups to their primary grid infrastructure. "Basically, almost every state from Washington D.C. north on the Eastern Seaboard has some microgrid resiliency platform in place," said Peter Asmus, associate director of energy research at Navigant Research. While microgrids have been deployed for decades, mostly in remote regions where the conventional grid isn't available or is less dependable, building one means a significant expense. Government entities like military bases or schools or businesses such as hospitals where a reliable power source is critical would have to purchase a power source -- solar panels, wind turbines or diesel/gas-fired generators -- along with power converters, distribution lines and a battery storage system. On top of that, a sophisticated power management system is needed to control the ebb and flow of power between the microgrid and the regional, conventional grid. For example, last month, Schneider Electric was awarded a subcontract from Constellation, a subsidiary of Exelon Corp., to support the development of smart controls as part of an energy savings performance contract at the U.S. Marine Corps Logistics Base (MCLB) in Albany, Ga.
A closer look at Schneider Electric's solar power car ports. And while some continue to purchase microgrids outright, businesses short on cash are turning to a new model called microgrid-as-a-service (MAAS). Scheider Electric, with about 60 deployments, leads the North America microgrid industry, according to Asmus. And it's taking the lead in that MAAS market. The microgrid industry involves some 50 companies, large and small, from Lockheed Martin and Siemens to Princeton Power Systems and GE Digital Energy. "The microgrid market is still wide open when it comes to market players and future opportunities for growth and maturation," Navigant Research said in an industry report. Schneider Electric has had a hand in building microgrids for 25 years, and for its own system partnered with utility-owner Duke Energy and its subsidiary REC Solar. Schneider, which builds the energy management systems and software, will offer MAAS to customers through multi-year power purchase agreements (PPAs) or leases. "We give them the benefits of a microgrid -- more reliable service, more sustainability and more efficiency -- and they don't have to make a big expenditure," said Don Wingate, vice president of sales for Schneider Electric's Microgrid Competency Center. It's Schneider Electric's business model -- a flexible one that finds it partnering with utilities and distributed energy providers -- that has made the company successful in the growing microgrid industry, Asmus said. Siemens, which at first attempted to offer the entire microgrid as a bundle, struggled to gain traction. The problem is that microgrid providers often arrive on a customer's site to find solar panels or battery backup systems from other providers already in place, so each installation may require different levels of build out. In addition, many customers may want to upgrade their existing electrical infrastructure to better support a new microgrid. That requires additional contractors. Just as solar rooftop installations on homes have skyrocketed over the past decade because of falling costs, there's a burgeoning business opportunity with affordable microgrids that now have an estimated return on investment of seven to eight years, according to Schneider Electric CTO Andy Haun. For example, solar panels today cost about 1% of what they did 40 years ago, according to the Department of Energy's (DOE) Solar Energy Technologies Office. Since 2010, the average cost of solar panels in the U.S. has dropped more than 70% and the cost of a solar electric system has dropped by more than half, according to the Energy Department. And, since 2011, the average price of a commercial solar panel project has dropped from about 34 cents per kWh to 13 cents, according to the DOE. At the same time, since 2010, lithium-ion battery prices have dropped by 80%, according to GTM Research Energy Storage Service. The drop comes as the DOE has invested heavily in battery R&D. Between 1992 and 2012, it spent $1 billion dollars on battery research. 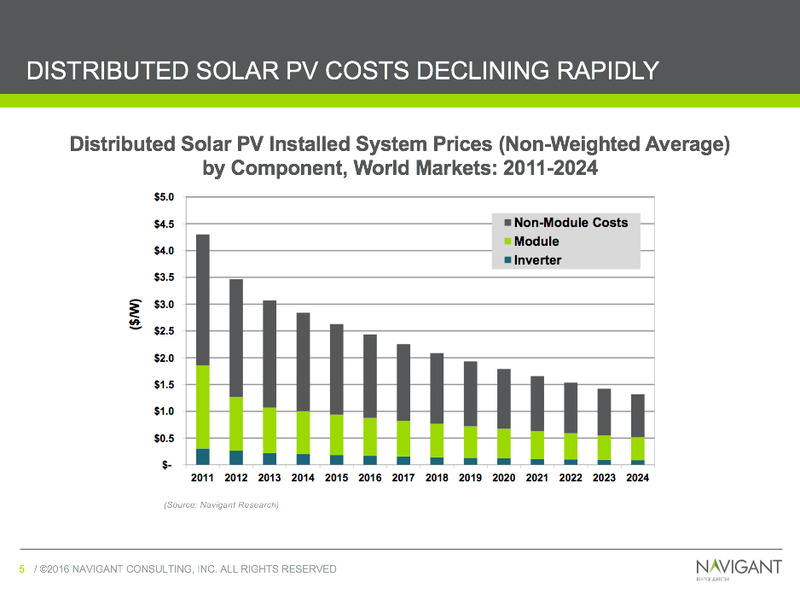 The declining costs of solar power energy systems. U.S. microgrids grew to a cumulative capacity of 1.18GW in 2014. Since then, nearly 500MW of microgrid capacity has been added, according to Elta Kolo, a GTM Research analyst. GTM Research now expects cumulative microgrid capacity to grow by 115% over the next 5 years to surpass 4GW by the year 2020. "This market growth is driven by an uptick in federal and state incentive programs, an interest and activity from utilities and [energy service companies], and emerging business models that share benefits, costs and ownership among multiple stakeholders," Kolo said. Utilities once considered microgrids competition. "Back when I started covering them in 2009, most utilities where hostile to microgrids," Asmus said. "They worried about them because most weren't deployed by them. They were a threat to their business model." However, utilities now see microgrids as an adjunct to their primary business - and one that can add profits to their pockets and resiliency for existing customers. Over the past three years, Charlotte, N.C.-based Duke Energy has taken a keen interest in developing microgrid technology, according to Jason Handly, director of smart grid emerging technology and operations at the utility holding company. "We've deployed two so far, basically for testing and development," Handly said. "We're still pretty young in the technology in the industry." Most states, however, have yet to even create a legal definition for microgrid. There is no consistent regulatory and legal framework between states, which have traditionally taken a role in the development of renewable technologies through grants or low-interest loans. "Earnest efforts are under way in creating blueprints for successfully developing a microgrid and navigating the legal, regulatory, and knowledge gaps associated with adopting these new technologies," an Energy Department spokesperson said in an email to Computerworld. Schneider Electric's microgrid consists of 1,379 solar modules spread across parking lot car ports and the building's rooftop, along with 13 inverters that convert 448KW of direct solar current into usable alternating current; the solar power is also stored in a 100KW lithium-ion battery system that looks a lot like a server rack in a data center. Managing the power from the microgrid is Schneider Electric's Energy Control Center, a roughly eight-foot tall, rectangular metal box made up by smaller, modular electronic units that marry the power from the regional grid and the microgrid so that either can be used when most advantageous. In addition to the Energy Control Center, Schneider's main product is the software that monitors and manages the electricity, which can come from a myriad of sources: photovoltaics, gas-fired generators, or battery storage with bi-directional converter. All must be married together to work with utility to distribute the power. By generating a portion its own electricity, a company can not only get cheaper power but it can also store it to be used during peak daylight hours. That's when utilities notoriously hit corporations with on-demand electricity charges based on exceeding an allotted amount of capacity. On-demand utility charges can make up as much as three-quarters of a corporation's energy costs and add up to millions of dollars in fees. That is one reason energy storage systems are expected to grow six-fold from 2016-2024 to become an $8.2 billion industry, according to research from Bloomberg New Energy Finance (BNEF). By 2021, the "behind-the-meter" market for energy storage (i.e., systems installed in businesses and homes) will become the largest market segment as opposed to those used by utilities, BNEF said. Microgrids also offer security that a larger grid can't. For example, a terrorist attack against the conventional grid would not affect a company running on its own isolated power source. One enormous challenge facing the utility industry is an aging infrastructure. Much of the U.S. energy system predates the turn of the 20th century, and the transmission and distribution lines were mostly installed in the 1950s and 1960s with a 50-year life expectancy. The more than 640,000 miles of high-voltage transmission lines in the lower 48 states' power grids are at full capacity, according to the ASCE. Additionally, the nation's grid was constructed to allow electricity to flow in one direction -- to the customer. With the uptake of distributed power sources, such as solar panels, businesses and consumers are increasingly selling back excess power to local utilities under state net metering regulations. Electricity delivery in the U.S. depends on a complex patchwork system of power generation facilities, transmission and distribution grids, local distribution lines and substations owned by an array of investor- and publicly-owned utilities, independent power producers and governmental agencies. For example, Duke Energy is a publically-traded company that runs utilities in five states, while Louisiana Energy and Power Authority (LEPA) is a state-run utility. "It's simple to just connect a distributed energy source into the grid, but the hugely hard part is to get them to not fight with each other," Duke Energy's Handly said. Joshua Rhodes, a postdoctoral fellow at the University of Texas at Austin's Energy Institute, said microgrids can be a more affordable solution than ripping and replacing an aging grid. "It may be that putting batteries in a neighborhood may be cheaper than upgrading transmission lines to allow power to flow backwards," Rhodes said. "That would defer upgrades. I'd bet that will be where microgrids first start showing up en masse." Behind California, North Carolina is second in the nation for solar power deployments. As a result, Duke Energy has had to put the brakes on how much power was being transmitted back to the grid from distributed customer sources because it was unable to manage it, Handly said. The key to controlling energy flowing from distributed power sources back into the electrical grid is the power inverter, an electronic device that changes direct current (DC) to usable alternating current (AC). Combined with either lithium-ion or flow batteries, an inverter and a power management system can regulate when to store energy and when to distribute it, better known as smart grid technology. Smart grids are still in their early days, according to Rhodes. "As soon as [utilities] have the ability to tweak demand, you can glean some economic value from it," Rhodes said. "They just haven't figured out how to fully monetize microgrids yet."